The papers used are the new Twitterpated DSP that is arriving in the new mini catalogue on the 1st of April. 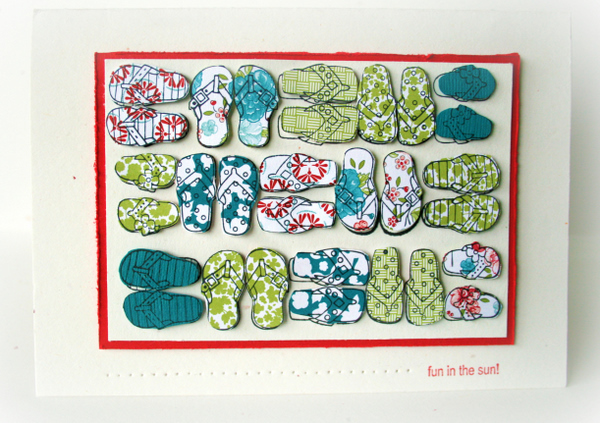 The stamp set is Sunny Fun which I then stamped the jandals(flip flops/thongs) onto the DSP with Stazon. I own a couple of pairs of jandals but would love all of these multi coloured ones! All of these are popped up with a dimensional. Hope you can play along with us this week. What a fabulous line-up of jandals. You have the patience of a Saint to do all that fussy cutting – so worth it. Very cute, happy card Delys – love it! That is a LOT of cutting, but so worthwhile as it’s a fab card. Love it. I love this card – the jandals look so cool. Thanks for sharing. Jandals…lol, Me thinks you have way too much time on your hands miss Delys..:0) Fabulous effect having so many grouped together, great card! 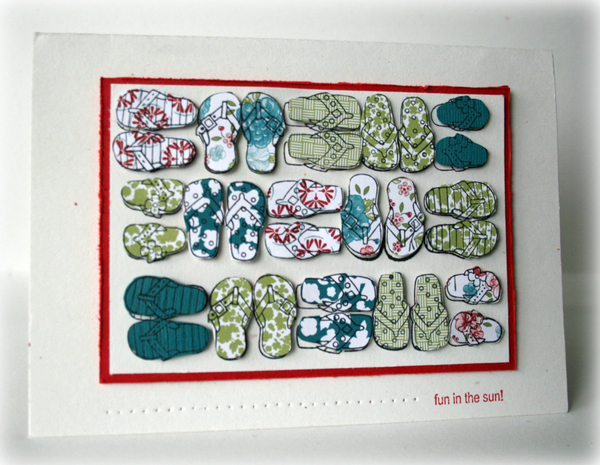 I love the fussy cutting of your THONGS in this card Delys – this is such a clever card.